Doing an MBA Degree not only gives you better career opportunities, but higher salaries also go in hand with this programme. Step up the Managerial Career Ladder! Study for a recognised UK MBA from the University of South Wales with an up to 60% UNICAF Scholarship. In today’s business climate, it’s important to have the necessary vision and skills to set yourself apart from the competition. This challenging and dynamic course is aimed at current or aspiring managers, and builds on a strong ethos of helping managers to solve real problems. It is designed for professionals who will make a strategic difference to the organisations in which they operate. The MBA programme of study introduces innovative business theory in a practical context. You will learn how to integrate cutting-edge research and practice across all key business areas to achieve business transformation, whether you work in a public or private sector organisation. During the MBA course, you will develop key leadership skills such as creativity, innovation, collaboration and problem solving. The MBA is grounded in principles that underpin business today and will give you a fresh strategic approach to the issues managers face. This challenging course will expose you to all areas of business through a diverse range of modules. You will study core areas of business with an emphasis on the strategic nature of decision-making. A critical part of the University of South Wales’s MBA is exploring how people impact on business thinking and the systems that can enhance this fundamental part of an organisation. With online-learning, or online education, you can have several advantages. Three of the main differences are that you can study whenever it suits your schedule, from anywhere and for a fraction of the costs of an on-campus degree programme. You receive all the study material you need online and interact through the online platform with your tutors. Who can benefit from online-learning? Whether you are a school leaver just starting your career, someone with family obligations, or a professional with a busy schedule, you can take advantage of it. But online-learning is not just convenient; it also becomes an integral part of a successful career. In the past, a student earned the knowledge that lasted a lifetime at the beginning. Today, according to the Financial Times, with the fast pace of progress, it is essential to stay on top of new developments. Furthermore, gaining knowledge combined with on-the-job experience can give your career an additional boost. 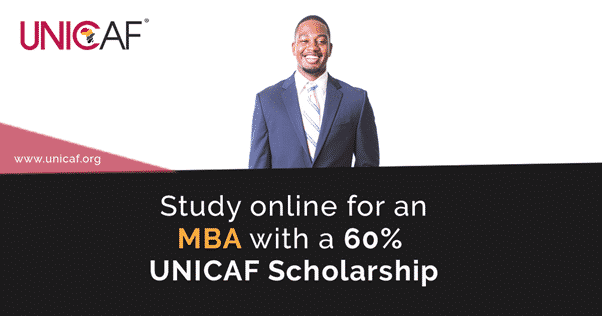 Apply here for a 60% UNICAF Scholarship today! Check Jerome Mark, an educator and MBA student and grab this opportunity! To apply please visit bit.ly.